My assumption in this article is that most accidents will happen without a supply of water on board. So, let’s equip our minds the best we can with some basic knowledge about finding water in the wild. Flying in the more remote places can be one of the great joys of aviation. But when operating an aircraft over those areas there is always the increased risk to your survival, as well as the survival of your passengers should an accident occur. I am referring to the added risk of having to survive in the wilderness for an extended period of time. Only about 40% of small airplane crashes are fatal, so the odds are that if you have an accident, you will survive and have to deal with the reality of your situation on the ground. This is one article in a series that Disciples of Flight is putting out to address different aspects of airplane crash survival in the wild. As human beings, we were given one mechanism in nature to help us survive, our minds. My assumption in this article is that most accidents will happen without a supply of water on board. So, let’s equip our minds the best we can with some basic knowledge about finding water in the wild. Keep in mind that in airplane crash survival situations, the ELT (Emergency Locator Transmitter) is most likely going to be what brings help to you. So stay close to the site of the accident, if you can. If you must leave (say to find more water) then leave clear unmistakable indicators of where you went. A healthy adult requires two to three quarts (1 liquid quart = 4 cups) of water in the regular course of a day. During times of high caloric burn such as exercise, that water requirement increases by double. As a person becomes dehydrated the first signs are an increase in thirst and irritability. In almost every activity that’s part of surviving in the wild, patience, and rational, objective thought is paramount to success. You MUST avoid degrading your ability to think clearly and rationally. In other words, you may think that “rationing” your water supply is a good thing, but that decision may be your downfall. We are not advocating starting a garden with your only bottle of water. No, don’t do that. Just make sure you don’t destroy your ability to think when you need it the most by starving your body of water. Consider the adrenaline dose your body will get in the event of an accident, the likelihood of various injuries, the probability of needing some mobility in the wilderness area around your crash, and just assume you will be needing twice the water intake. Never drink Salt Water, and yes, urine is salt water! I don’t imagine a whole lot of us are just looking for a chance to drink our own urine. So in the event of an accident, it’s safe to assume that resorting to drinking urine for hydration will come late in the process of dehydration. By that time, urine is mostly salt and other waste. When you drink urine your body will use its water supply to eliminate the salts and waste in urine and make the situation worse. In a perfectly hydrated person, urine is ninety–five percent water and five percent waste. But as you become dehydrated the amount of water in your urine decreases dramatically leaving you with just a really bad tasting option that will likely not help you at all. I understand that in TV shows, it’s a crowd pleaser to see a man drink his urine to “survive” and technically it may even be true that you could. But the reality is that you don’t need to drink your urine. Regarding salt water, it’s pretty common knowledge not to drink it. But if it’s the only readily available source of water around make sure you boil and distil it to eliminate the salts and other wastes before you do so. Otherwise, your body will draw on its available water to eliminate those salts and dehydrate your system more. I am going to also add blood to this list. I have heard people in the world of survival technique refer to drinking blood. Blood is plasma, red and white blood cells, and platelets. Your body has a process of breaking down foods and separating these into nutrients and waste. This happens with a filter called your kidneys and drinking blood before the kidneys temper the amounts of salt and waste in the blood will net the same result. You body will draw on its available water supply to eliminate those wastes and cost you more water than you get from the blood. 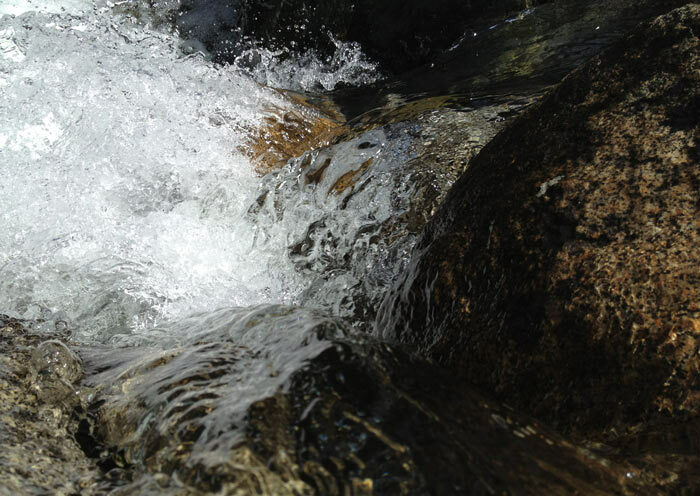 Another myth is that “wild water” is safe water. I hear it a lot when I am out backpacking with buddies. They tell me how water that’s cascading down rocks and otherwise moving is clean enough to drink. I always object, and they always insist that the rocks clean out the bacteria. The truth is that moving water is better than stagnant water but still not safe to drink just because it’s in a bubbling brook in the wild. Pollution from the countless careless outdoors enthusiasts is at an all time high and climbing. Now-a-days people take their animals (especially dogs) and let them poop and urinate right in the water or next to it. Add that to infected wildlife, and that should cause you to purify all water you drink. Most of the surface water in the United States is contaminated with Giardia and Cryptosporidium. These are invisible and can make you a miserable mess for over a month. In fact, according to the CDC, over 1,000 deaths occur each year from contamination of microorganisms in the water. Remember our goal is to survive, not kill ourselves slowly and painfully over the course of several months of diarrhea. Surface water, ground water, precipitation, condensation, plant sources, and tools you can create to filter or clean water are the primary sources of water that are usable and obtainable from Mother Nature. Examples of surface water would be a lake or a pond, a puddle or a glacier/snowpack, rivers, streams etc. Basically, water that’s on the surface of the ground is surface water. This source of water is easier to locate in most situations but not without its downsides. Surface water generally has bacteria and viruses, and protozoan as well as soot, clay, and dirt. This source should always be filtered before consuming it. But let’s start with some tips on finding surface water before getting into filtering. Insects are a sign of nearby surface water. For example, if bees are present in the area then water is likely nearby. Likewise, swarms of mosquitos are a sign of surface water somewhere in the area. This water source, indicated by the presence of certain insects can be miles away so I don’t mean there’s water right behind you. Ants require water and though they travel great distances they often place their nests close to some source of water. In the dawn or at dusk birds can be seen flying low and in a direct path toward a water source. This is something you can use to locate a potential source. If there are many birds circling an area then that can be a sign of a source of surface water also but keep in mind that flesh eating birds such as vultures, eagles, falcon, etc. do not need as much water and often circle a carcass and not a source of water. Frogs, Salamanders – these require water and are a great indicator that a source is nearby. Mammals often travel the same paths to water sources and travel at the same times as birds, dusk and dawn, to those sources. If you spot plant-eating mammals headed together at those times of day then it’s an indicator that they are going to water. 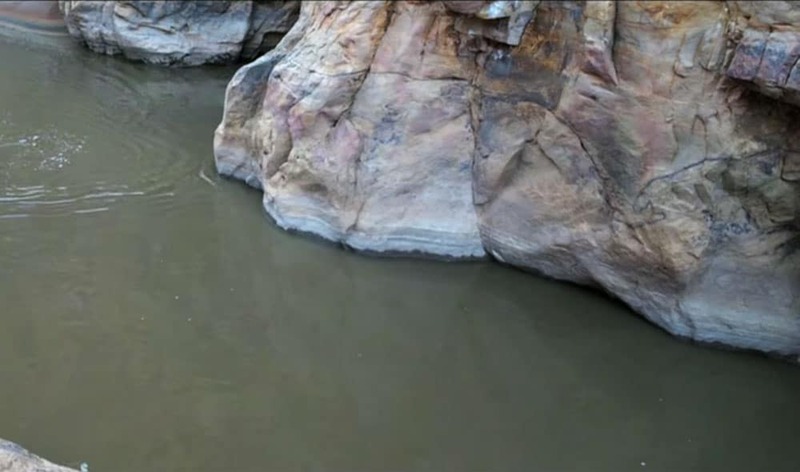 More likely you can see evidence of a water hole from mammals from the often traveled trails they leave when returning to a water source. Converging trails are a good pointer that they’re leading to water. As with aviation, you want to couple multiple indicators before taking critical actions and so combining one or more of the above with land features is good practice. Valleys and drainages are good water indicators and when you see converging animal trails leading into drainage while you fight off mosquitos, well, it’s a better bet than just drainage or just a merging trail. Your supplies are limited, your time is limited and making the best decision you can is critical. Plants can also be a valuable indicator. Trees line rivers and are found near ponds. Smaller green plants at the base of cliffs can indicate water is near. If you do not have a commercially purchased water filter and you have found a source of surface water it’s a good idea to filter it before drinking from that source. I have found that creating a simple seepage filter is almost always something you can construct and works similar to how ground water is filtered on it’s way to an aquifer. To create a functional seepage filter, dig a three-foot wide hole about ten feet from your water source. Dig down until the water starts seeping into the hole. Dig about another foot down and line your seepage hole with rocks and wood so that the sides of your hole don’t fall in, then let it sit overnight so the soot and dirt will settle. Locating Ground water is more difficult due to the fact that it’s…under ground. There are some advantages to groundwater in that it’s often not necessary to filter it, although I would always err on the side of caution and filter the stuff as well as boil it if I can. To locate groundwater, identify things vegetation that’s out of place. 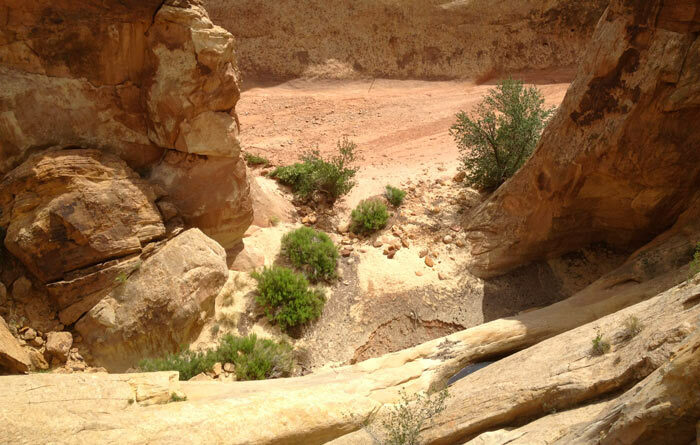 An example is the dry riverbeds common to the deserts of Southern Utah’s popular backcountry. Pilots love these areas, rich with beautiful red rock and stunning vistas. These areas are high desert and are streaked with dry riverbeds from flash-floods. Most of the time there is not water in these dry riverbeds and mostly just rocks grow in the area. But if you were down in that desert and spotted a patch of lush green plant life clustered near a bend in a dry riverbed, there’s a chance that a ground water source could be tapped into there. 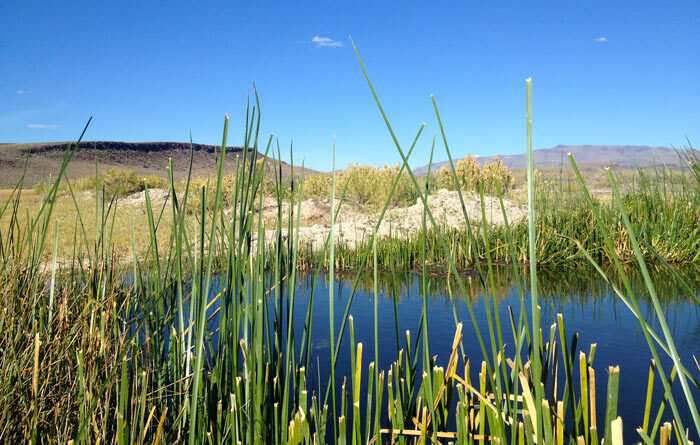 I can’t tell you how many times I have been hiking in those dry canyons and came across a lush green area of grass and cattails seemingly growing out of a sand dune. Well, chances are there’s water below the surface and can be accessed by digging a small seepage well at the source. Remember to let it sit overnight and apply the technique described previously for seepage filtering before drinking. Snow is a good source of water but don’t eat the snow for hydration. Heating your body takes energy and water is a part of how your body produces that energy. Eating snow will costs your body more than it’s worth to your body. Melt the snow then drink the water. I also advise you to treat the surface of the glacier or pack the same way you treat surface water vs ground water. If possible filter it, boil it, then drink it. Sea ice should be tested to make sure it’s free of the salts present in the water before melting for consumption. A simple taste test is all that’s required. If the sea ice tastes salty then don’t use it. Generally, blue or black sea ice with rounded corners shatters easily and is good to go, but always test it to be sure. Although not a large source of water, Dew is clean and can save your life. Dew collects on grass, rocks, possibly on the fuselage of your airplane in the mornings and evaporates pretty quickly as the day goes on. Take a cloth and collect the Dew with the cloth then wring the moisture into your mouth. If you have a plastic bag or tarp you can create a vegetation bag to get water from local plants. This doesn’t work so well in the desert on a cactus nor would it be a good idea to use poisonous plants like Poison Oak or Ivy, so apply common sense when selecting which plants to use in your vegetation bag. Here’s how it works. Plants emit moisture right out of their leafy bodies. Fill the plastic bag with lush green vegetation and air (roughly half full with vegetation and the rest with air) placing a rock or heavy (clean) object at the bottom of the bag and secure the bag closed (as airtight as possible). The rock is to create a space at the bottom of the bag lower than the plants. Place the bag in direct sunlight with your rock on the downslope at the lowest point. The vegetation will emit water, which will condense and accumulate at the lowest point of the bag for you to drink. Make sure you collect the water before sunset or the moisture will be reabsorbed into the vegetation. A Transpiration bag can be more effective than a vegetation bag because the plant life can be reused after letting the plant or tree rejuvenate. The theory is the same but you wrap a living plant in the bag. For example, you find a lush green tree and wrap a leafy bushy end in the bag fastening the closure end of the bag tightly around the branch(s). Same as above a rock is placed in the bag, which hangs low and provides a point for condensation to collect into drinkable water. Sometimes a more direct way to get water from vegetation is available. Plant or trees with hollow portions can collect water right inside the plant. The most famous of these is the cactus. Hmm… maybe coconuts are the most famous source of fluid… not sure which is more common knowledge but you should also be aware of banana trees, pineapple, water vines, and plants that have overlapping leaves allowing them to collect rainwater such as bamboo and air plants. A myth about cacti is that you hack it open and there’s a jug of water inside. I have never seen this in real life. No, it’s always been a moist pulp that you can absorb with a cloth and wring into your mouth. So if your plan is to harvest water from the Arizona cacti then make sure you bring a porous cloth or it will be a cumbersome and possibly failed exercise. Filtering Water does not purify it. It simply gets the dirt, bugs, and other sediment out. Boiling water is a great way to destroy bacteria, viruses and purify the water for your protection. The general rule is to boil your water for one minute, let cool, then drink. Depending on the altitudes you find yourself you may want to extend that time to two minutes as water boils at a lower temperature at higher elevation. The boiling point of water is 212 degrees F. With each 500-feet increase in elevation, the boiling point of water is lowered by about 1 degree F so at 10,000 feet the boiling point is 192 degrees F. We want out water to reach 212 degrees for at least one minute. Boiling water is still the most effective purifying method you will have. Even cryptosporidium, which can survive iodine or chlorine is destroyed by boiling, so boil your water if you can. Can’t Boil My Water, What Now? If you have no commercial purifier including chemical tablets or drops and for some reason, you cannot create a fire to boil your water (or maybe you have no container to boil it in), is there an option for purifying water? Yes. The vegetation bag works off condensed evaporation i.e. distillation. This creates a clean source of water. You can also create your own Below Ground Solar Still. It’s similar to the vegetation bag, except you don’t need a bag. You will need a container to collect the water in. Look for a location where the ground contains moisture such as a bend in a dry stream, near lush vegetation, or a low-lying area where water may have recently collected. Dig a hole approximately three feet across three feet deep. Place your water collection container in the bottom of the hole. Take your tarp or plastic poncho, maybe the headliner of the aircraft (if it’s still intact) and lay it over the hole. Secure the covering so it is not going anywhere, place large rocks or wood on the edges. Next, you are going to place a small rock in the center of the covering (on top). This should cause the tarp or covering to droop in the middle, right over your water collection container. See, as water condenses it needs to run down this droop inside the Solar Still and drip off the point into your container. This requires sunlight on the Solar Still so don’t build this in the shade. You can urinate on the ground inside the still. As the moisture from the urine evaporates, clean water is produced. You can live without food for between three weeks to two months. Contrast that to your ability to survive without water: three to five days, and you see where the survivor’s priority should be. One of the best storage devices for water is your own body. If you find yourself in a survival situation in the desert, for example, then regulate how much water your body will lose by working in the evening when it’s cooler and resting in the shade during the day. Limit your daytime activity and try to travel and do your work at dawn and dusk. Keeping in mind that injuries are a major concern I would emphasize the working at dawn and dusk, NOT at night! The lack of visibility in the wild will increase greatly your chance of injury and this is to be avoided. For the absolute best solutions to surviving in the wild, specifically as it relates to your need for water, you need only refer to the motto of the Boy Scouts of America “Be Prepared”. Having a survival kit in your aircraft already packed with a way to build a fire, water filters, and purifying options is going to be the best solution and provide you with additional options when trying to improvise during an extended stay in the wild. I recently stood looking at the charred, melted wreck of a C172 that had crashed in the mountains near Salt Lake City, Utah. It was sobering and sad. 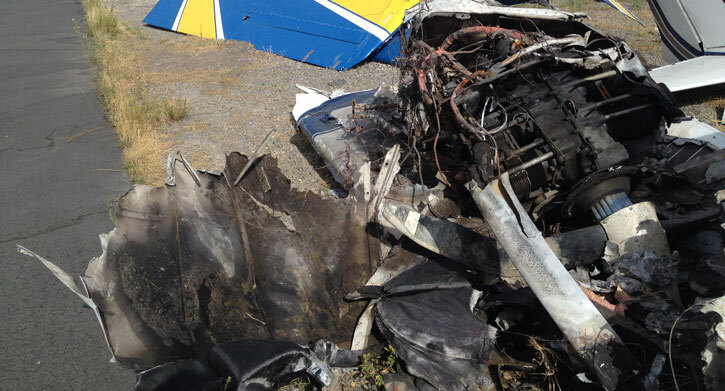 The airplane had caught on fire and was now just a heap of remains. Anything in that airplane as it burned would be much less usable to the pilot who may have gotten out and now needs to survive. In light of that, make sure that when operating over wilderness you keep your emergency supplies and tools in a single bag close enough to you (the pilot) that you could open a window or a door and air bomb that bag to the ground on your way down. Make note of where you drop it, it’s gonna be quite a walk to find it and you will want to minimize that effort by being smart about when and where you eject it from the airplane. I am not going to recommend specific brands or anything, just types of solutions. The world of water filters has come a long way and you have many options. I will say that UV lights or wands do not filter they only kill the bacteria and viruses. They also can’t purify the water if it has a lot of soot or dirt content (cloudy). I have tried theses and in many environments, and they simply will not work. A ceramic or element filter likewise has restrictions such as not being able to filter salt water or becoming clogged when water carries a lot of dirt and soot in it. Using some of the filtration techniques listed above + using your commercial filter is a good way to work around some of these limitations. Having both types of filter is expensive and still does not guarantee that wherever you go down you will have the right tool for that environment, but it’s better than just one. I suggest you get a high volume filter such as a gravity bag and a purifier, which can be chemical tablets or a UV wand. A gravity bag is a large waterproof bag that has a filter at the bottom with a rubber hose for drinking from. It’s easy to clean and reuse and you know when/if mud is clogging the filter and making it ineffective. Once the water is filtered you can put it in a pot or drinking container that’s smaller and use your chemicals, boil it, or use the UV wand and kill the bad invisible microorganisms. I actually use this method just when airplane camping because most the people I go camping with are always asking if I have water and I don’t want to spend my trip down at the river pumping water bottles for everyone. The gravity bag fills with a gallon of water and hangs from the wing strut of my C182 using gravity to force the water through the filter at the bottom. I often land on airstrips (Mexican Mountain and Hidden Splendor) along a river called “The Dirty Devil” which is running fast and full of soot and dirt. The right Gravity bag will take care of all that mud when a normal water filter would be destroyed and useless. They are also just a foldable bag so they are light and small to store. As an added side benefit they provide me with a plastic bag and rubber tubing should the filter fail or be damaged and I need to make a vegetation bag or a Solar Still. As the kids say these days “that’s a two’fer”. I hope you found this helpful. I know there is more we could discuss about water in the wild and I know many of you pilots are even more knowledgeable than this ole hiker. Please leave any questions you have in the comments below and I’ll do my best to respond. We have a wealth of knowledge in our Disciples of Flight community so I imagine we will all be surprised and edified by taking the time to ask questions. We hope you enjoyed this first article on airplane crash survival tips, centered around finding water. Coming next: How to Build a Fire with Nothing.